Paragon is a YouTube Network & Management Co fueled by Creators. We've united ourselves in order to provide you with the support & features you need to create great content! We're a YouTube Network and Talent Management Company founded by a board of experienced content creators. 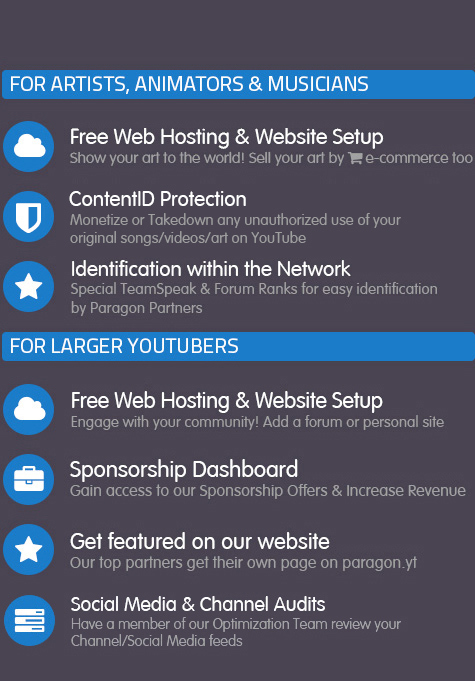 Our goal is to empower YouTubers with the tools and support they need to create great videos for their audience. We're committed to helping our partners find business and collaboration opportunities for their channel. We're YouTubers too! We know what you're looking for in a network! We sponsor YouTuber Micro-Communities (Game servers & TeamSpeaks)! Contracts! The best contract we can offer is a contract that you feel comfortable with, that's why we've made it simple. You're free to leave at any time, with a 30 day notice. Large partners with original content can monetize their videos instantly, without going through ContentID. No minimum payout & Automated monthly PayPal payments. 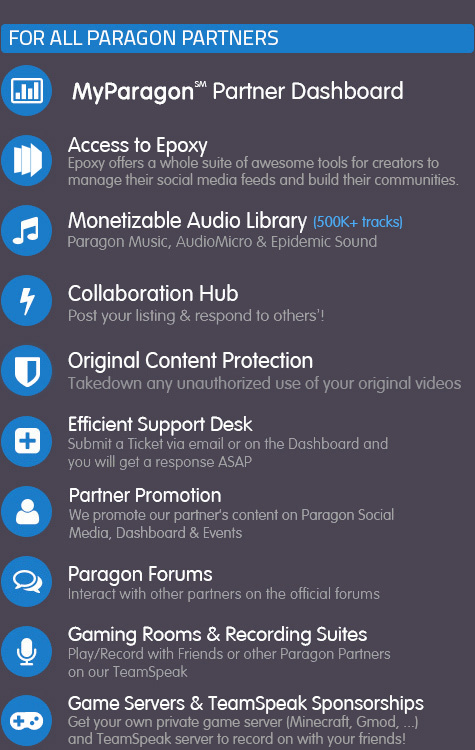 Everything at Paragon is built around you and your channel to help you grow your audience and increase your viewership. This is a service we offer that is aimed towards medium-sized channels. If you need some advice or you feel stuck, contact one of our partner managers so that they can help you over a certain number of sessions. Our partner managers are YouTube Certified industry specialists. For larger channels, if you feel like you're doing everything right but you're just not getting the audience you're looking for or just simply want to see where your channel/social media feeds might be lacking, we offer audits (detailed analysis of your channel/social media feeds) so that you can pinpoint the areas that may need improvement. It is a well known fact that working with other content creators will attract viewers to your channel, but it isn't always easy to find people to work with. That's why we're really developing the community side of Paragon so that you can easily find someone to record with or to learn from. Paragon (PGN) LTD © 2019. All Rights Reserved.